​Everyone always wonders, what really is the key to a beautiful smile? Of course there is no clear cut answer. A myriad of factors play role when talking about a beautiful long-lasting smile. A gorgeous smile makes one look younger and is a sign of self-confidence.And surprisingly achieving a perfect-looking smile is not too hard, thanks to porcelain veneers. Handcrafted specifically for each patient, porcelain veneers can help hide chips and cracks within the so-called the smile zone. 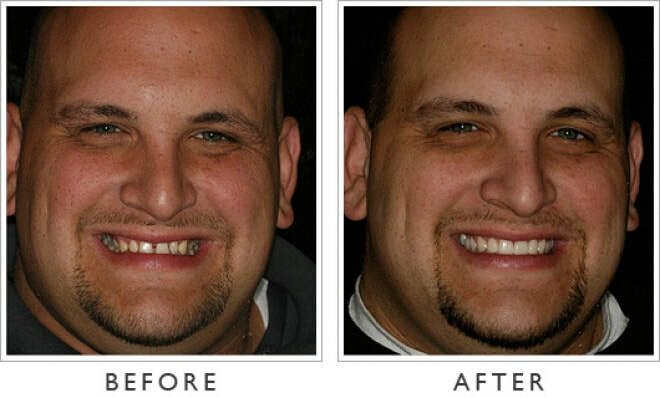 ​Veneers can also help cover gaps in teeth, and can drastically change the overall appearance of your teeth. Porcelain veneers as well full porcelain crowns can significantly improve the appearance of front teeth. Determining whether a patient should have porcelain veneers or needs full crown placement depends on what result each individual patient is seeking to achieve. Porcelain veneers is an option that is often chosen when the patient is trying to address shape and discolouration issues. Secondary issues that are targeted by veneers are problems with crowding and gaps. Crowns on the other hand are used when dealing with teeth which are overly decayed. Crowns are also used when teeth have undergone root canal therapy. Overall, porcelain veneers are much more conservative that crowns, reason being a significant difference in the amount of necessary drilling. By the same token veneers are not as strong as full crowns. That is because less tooth reduction is implemented with porcelain veneers. Consequently patients with porcelain veneers need to exercise more caution while biting into tough foods, because there is risk that the veneers will break. In comparison, patients with full porcelain crowns can pretty much bite into any food without fear of breaking the crown. Additionally when distinguishing veneers and crowns, dental professional adhere to the position that crowns are a better option for patients who have large old fillings or a deep bite. Going with porcelain veneers means choosing a less invasive approach which is much more efficient in patients who haven’t had many previous restorations. ​Both porcelain veneers and full porcelain crowns are alternative ways to get a beautiful smile, although both end goals aren’t often easy to achieve. We have very experienced dentists who are eager to take on the most challenging patient in Edmonton, Sherwood County, Strathcona county and surrounding areas in Alberta, Canada. And these challenges that we usually take on, are not about making beautiful teeth, but instead about making beautiful teeth which will work great throughout a lifetime of use.